You are following a team of intrepid paranormal investigators down a dark corridor with nothing but the dim light of a television camera to guide you. You sense the fear mount as you are reminded that people have been murdered in the building that you are being guided around. There is a overwhelming sense that something is about to happen. Suddenly, out of the darkness, a noise shatters the silence. One of the team screams, the camera shakes, and you follow the investigators as they run to make their escape. Such is a typical day in the life of paranormal investigators on the Most Haunted television programme (airing on Living TV and also a popular DVD). The basic theme of the programme consists of the paranormal investigators visiting well known historical sites that have been rumoured to have strange and ghostly goings on . The most influential member of the Most Haunted team is spiritualist medium Derek Acorah, a very charismatic personality who has the team spell bound as he discloses intricate details, facts, places, events, and people from times past. In addition to all this, throughout the series, there are mysterious noises, things seem to move, and there are images of such things as "orbs of light" captured on film and camera. It is all tense, riveting viewing, but what is really going on? Is it really the activity of ghosts or are there other possible explanations? And what are Christians to make of claims of ghosts and paranormal activity? This article will seek to answer these questions. Theory 1: A Naturalistic Explanation. I believe that one of the possible explanations for the facts and intricate details that Derek presents to his viewers about the buildings he visits is that he already has prior knowledge of the buildings he visits beforehand. As a paranormal investigator, and one who already has an interest in well known and allegedly haunted places, Derek could well have a good knowledge of the places he visits. It would therefore be possible for him to have the information about the buildings he visits, even if he doesn’t know where he is going. The information is certainly readily available for those who want to read up on such famous haunted places as The Skirred Inn, Tutbury Castle, The Station Hotel, etc. As well as the histories of such places being available in public libraries, even a simple a word search on the internet reveals many details. When the programme is watched with this explanation in mind, it loses a lot of its mystique. For example, The Skirred Inn is a pub in South Wales which has a well known history of mass executions in times past. The details of this are easily available to anyone interested enough to research it. Likewise, Tutbury Castle, is another famously haunted building, which even boasts the residence of a famous ghost - Mary Queen of Scots. Again, it is a well known haunted location with a history that is easily accessible. In the series, the castle is even described as place that has "a good history of hauntings" (Phil Whyman, Most Haunted 2. DVD) and a location that has "Too much paranormal activity... reported here to be ignored." (Yvette Fielding, Most Haunted 2. DVD). Theory 2: A Supernatural Explanation. Even though the above explanation is one possibility, as a Christian, I do not believe that it is the only one. It may well be that Derek is indeed receiving information from spirit entities, but that these are something other than ghostly spirits of the departed. It is also possible that the information being given is a combination of both Derek’s own memory and messages from spirit entities. "For our struggle is not against flesh and blood, but against the rulers, against the authorities, against the powers of this dark world and against the spiritual forces of evil in the heavenly realms." (Eph. 6:12). The Bible also has a lot to say about exactly what such spirit entities actually are and what their purpose is. In the episode about the Skirred Inn, in the Most Haunted series, Derek Acorah stresses his belief (as a spiritualist medium) that the Devil does not exist. But if the Bible tells us that the Devil is the father of lies what could be the ultimate lie that he could tell? That he doesn’t exist. By making people believe this he is free to operate unchallenged and unhindered. The real truth is that the Devil does indeed exist. The Bible declares this as do countless people through history who have encountered him and the evil spirits that serve him. Are we really to conclude that all these people were simply lying, or maybe hallucinating? Indeed many of these people did not come from a Christian world view and so the concept of a Devil or demons were not at the forefront of their minds prior to these experiences. However, for those who have become Christians, their faith, and what the Bible says about the Devil and the spirits which are under his command, has enabled them to make sense of their experiences. "But the Spirit [the Holy Spirit] explicitly says that in later times some will fall away from the faith, paying attention to deceitful spirits and doctrines of demons..." (1 Tim. 4:1). "...for even Satan disguises himself as an angel of light." (2 Cor. 11:14, emphasis added). 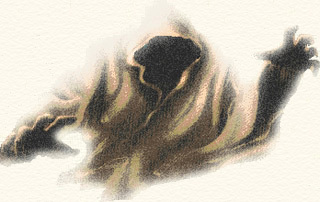 The Bible explicitly forbids attempted contact with spirits that pretend to be spirits of the dead (Deuteronomy 18:11). The Bible states that the dead do not have contact with the living (Luke 16:19-31). The reason for this is because such spirits are not spirits of the dead but rather deceitful spirits under the command of Satan. The Bible calls such spirits "demons", "evil spirits", and "unclean spirits". These demonic spirits are familiar with the departed dead whom they seek to imitate. This is why they are able to supply people with intimate details of names, places, and facts. Indeed, Isaiah 29:4 calls such a spirit a "familiar spirit" (KJV). "...blinded the minds of unbelievers, so that they cannot see the light of the gospel of the glory of Christ, who is the image of God." (2 Cor. 4:4). The good news is that people do not have to remain blinded in the darkness. The Bible tells us that we can come into a relationship with Christ who is "the light of the world" (John 8:12) and be free from the fear and control of dark supernatural forces.